This FREE event, put on by your Airman & Family Readiness Center is open to Family members of currently Deployed or Remote Servicemembers and all Ellsworth AFB Key Spouses. 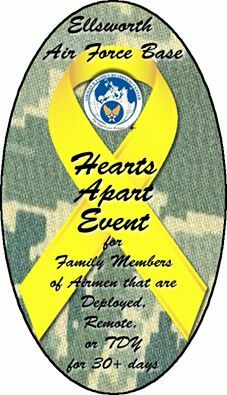 We will have food, patriotic crafts & supplies to create a personalized welcome home banner, as well as fun for the family. Contact MSgt Jennifer Plascencia at 385-4663 or jennifer.plascencia@us.af.mil to let us know if you are coming so that we can plan for food and activities. This entry was posted in Key Spouse Program and tagged Community Events by ellsworthlaurie. Bookmark the permalink.